Can you tell I'm tapped out on coming up with cute title names? sorry. After I made my ottoman covers I decided it was time to make new pillows for my sofa too. Since I already had the sewing machine out, it was now or never. I got this fabric awhile ago and it was just waiting for this project. It's kinda like a thin scarf material, so I needed to back it with fusing first, and then I got to work sewing piping and backed the pillows with a bright orange cotton fabric. I love that they have some pink in them, bringing in some of the color from the new ottomans. They also have my favorite ORANGE, as well as some teal to tie int he walls, some navy to tie in the zig zag pillows, some neon to get my neon fix, and a mix of other pretty colors. don't mind the bookcases- they need major HELP. See my cute little monogrammed Lucite bench there- I just love it. So there you have it, the new look of my family room. My husband asked how long we will be living with this look, I told him not to worry he will have another look to enjoy in about 3-6 months. They are gorgeous I love the touch of pink and orange piping! Very artful! Join my amazing Giveaway from the Artisans at Novica. You will love it! Love 'em - they look like watercolor paintings! Those are really great! Do you use a pattern or do you just wing it? I have yet to use my Brother sewing machine I got a few months ago. haha - i love what the hubbers said - something Joe SO would say to me!!! looks fab! pretty! look slike you did a great job, and I love the way the color and pattern sort of bridges the more traditional elements, like the rug, and the more modern ones, like the lucite stool. Wow! These could definitely be sold online. I love the blue/orange combo too! I love these! I'm also loving your Lucite ottoman in the back. I change my pillows all the time too and my husband can never keep up. 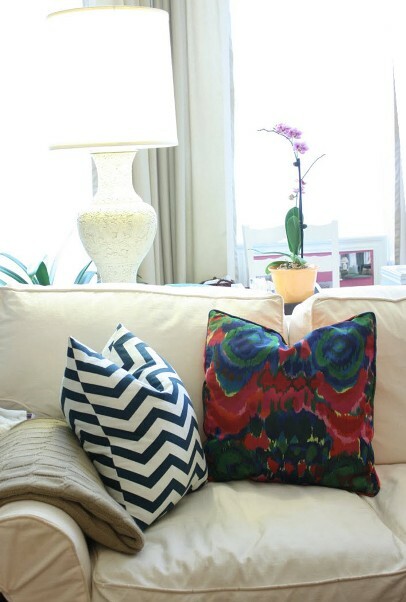 Very pretty pillows, such a lush look! Love love LOVE the fabric on the new pillows!!! I LOVE them so pretty! I love the pillows, good job! Hi. Can you tell me the paint color on the back of your bookcases? I looove it. Amy, so sorry this answer is late- but the color is Benjamin Moore Deep Ocean, #2058-30. I love it- its such a pretty color! Love the pillows, where did you get the fabric? I'm planning on making my own pillow cases but having a hard time finding the right fabrics! Love what you went with! Michelle, the chevron pillows are from Twinkle Living and the fabric from the other pillows is a no-name fabric. I got it at a local discount fabric store here in Boston. It's actually like a thin silk scarf material that I just fell in love with and used some iron on fusing to make it work for the pillows. I'm sorry I'm not more help- I wish I had a name of it because I want more! Love your fabric picks!! Thanks for the source info!